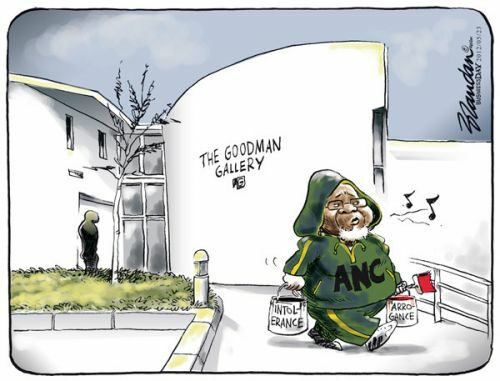 Keen observers of bogus piety would have been enthralled last weekend as the South African Media Synchronised Hypocrisy team went into their final stages of training before this year’s Olympics. Just in case you’ve been paying attention to more mundane matters such as the meltdown of the Eurozone or the fact that many school-kids in SA still don’t have textbooks 18 years into our rainbow democracy let me bring you up to speed with the curious case of the President’s honourable member. The feisty editor of the City Press, Ferial Haffajee printed a pic of the Pres’s privates from an exhibition by Brett Murray in her newspaper which annoyed the masses. She bravely stood her ground, rather like the young lad in Eng Lit who stood on the burning deck when all but he had fled. Then, last week, some art lovers managed to get past the heavily armed artillery at The Goodman Gallery and defaced Brett Murray’s provocative painting by smearing black and red paint over the offending organ. Some say this may have even improved the work and if I were defence counsel for the “vandals” I would plead that my clients were merely artists adding to what had become a “work in progress”. The fact that the buyer of the now vandalised The Spear is still happy to take it in its new state surely means that the case has to be thrown out because there can be no charge against the two additional artists if the buyer is happy. Damn it….I really should have become a lawyer after all. I would go further though. I would suggest that the price paid for The Spear should now be shared (after the modest gallery commission) three ways. That at least would help one of the new artists to pursue his case against the security guard who decided to give him what is known as a “Glasgow greeting” in front of the world’s cameras. Meanwhile the painting’s most vociferous critics declared that the alteration to The Spear didn’t change the fact that it had been painted in the first place and was obviously racist and a post colonial attack on all black men. Then a leading church member called for the stoning of the artist (I assume he meant “to death” rather than a sprinkle of light gravel) and various branches of the ANC decided that a march on the Goodman Gallery would be a good way to spend a bracing winter’s morning, irrespective of the fact that the painting no longer had offending dangly bits and had now been moved to different location. When the people on the ground decide on a march there’s little that will persuade them otherwise. The focus of attention then moved from the original work to the picture of the work on the City Press website. Gwede Mantashe, art lover and champion of a free media that he is, demanded that Ferial Haffajee remove it at once and called on all ANC members to boycott the City Press until the picture was removed. Doing a very fine impersonation of Joan of Arc, St Ferial of the Phallus stood firm and refused to be cowed by mere politicians and the angry mob. The freedom of the media was at stake she cried before exhorting freedom loving people to rush out and buy multiple copies of City Press that Sunday. Even Sunday Times editor Ray Hartley was moved to emerge from nine months hibernation on Twitter to express solidarity with his “sister”. The family likeness isn’t immediately obvious although I’m told they both suffer from spinal problems. The usual Cabal of struggle cred journos joined the supporting throng and SA media’s very own Agincourt was under starter’s orders. Would the thuggish ANC silence the brave men and women of the SA media? Well, as it turned out we needn’t have bought those solidarity copies of the City Press because by last Monday morning the offending picture had been removed from the City Press website by none other than St Ferial herself. Having lathered herself in the soapy suds of 24 hour media attention for over a week while claiming to be a champion of free expression Ferial suddenly did a U turn and dumped her supporters. What had happened? Had Oom Koos phoned , as Business Day editor Peter Bruce speculated, and pointed out to his now world famous editor that Naspers has other interests which might be affected by a bad relationship with the ANC? Or had St Ferial finally tired of doing her martyr voice on all those radio interviews? Well life is sometimes stranger than fiction and in this case “the straw that broke the camel’s back” was a Tweet purporting to be from billionaire Patrice Motsepe which mocked St Ferial’s single marital state and suggested that was why she wanted to gaze upon the presidential crown jewels before going to bed after a hard day’s activism. Odd that St Ferial didn’t smell a rat after receiving a Tweet like that from a well respected businessman. In fact the penny only dropped when the real Patrice Motsepe contacted the, by now, very confused St Ferial to point out that the comments came from an imposter. So where does this leave poor Ferial? Surely anyone with even a passing acquaintance with social media knows that, like Strawberry Fields, nothing is real and that people are often not who they say they are. There are over a dozen Jesus Christs on Twitter for example. For her to imagine that Patrice Motsepe would risk his professional reputation by posting a sexual taunt worthy of a genuine troll on Twitter is beyond comprehension. He’s not exactly a 20 year old swimsuit model is he? Then there is her professed love of freedom of expression which doesn’t ring true given her recent history. Last year she decided to slice up Kuli Roberts one Sunday evening on Twitter after whipping up a vilification campaign against the columnist for something she had written in the Sunday World. Roberts was labelled a racist and lost her column. An editor who really believed in media freedom would have allowed Roberts’s column (already passed fit for public consumption) to stand and attacked her in words the following week. Then there was the Eric Miyeni incident which Haffajee blew out of all proportion in order to get him sacked. It’s amazing what a wilful misreading of an article can do to a man’s career. Haffajee, in my experience, also seems reluctant to engage in debate with anyone who might be rather more articulate and hold views with which she is not comfortable. Just in case I am wrong on this score though allow me to throw the gauntlet down and invite her to a live public debate on neutral ground. Her decision last Sunday to run a column by disgraced former youth leader Julius Malema encouraging people to buy the City Press suggests that this whole Spear farce has been one huge carefully manipulated publicity stunt…..and one that was designed to anger certain factions of the ANC. I suspect it started that way but things got horribly out of control. Haffajee’s credibility as an editor must be called into question, particularly considering the Motsepe Twitter incident. Maybe it’s time for a career change or perhaps somebody just needs to whisper in Ferial’s ear that she is supposed to be reporting the news, not manufacturing it or starring in it.